To keep the Clean Power Plan alive, some people are appealing to Scott Pruitt's faith in God. The EPA administrator, who is a Southern Baptist, has fought against the Obama administration's signature climate rule since his days as Oklahoma's attorney general. Now the agency he leads is in the first phases of undoing the rule, by seeking comment on the proposal from the public. A number of commenters made it clear that EPA's decision to reconsider the rule did not mesh with their own religious views. They challenged Pruitt to reconsider his opposition to the Clean Power Plan in light of his moral obligation to protect the planet. One woman told Pruitt to review the Bible's teachings on the environment. "[I]f you are among those Americans that have turned your back on science because it challenges your beliefs, I urge you to consult your religious texts," wrote Jessica Ferrato. Ferrato noted that citations in the Bible about care for the environment could be found from "Genesis to Revelations" and were supported by a range of Christian denominations, as well as non-Christian teachings. "[W]hether you are guided by science or religion, by mathematics or by the lure of cold hard cash, our morality, our life experiences, and our success as a species and as a society is fundamentally connected to the care with which we manage the bounties of our natural world," Ferrato said. Greg Rockwell, meanwhile, expressed his disappointment with the administrator more succinctly. "This is a sin. Please repent, and follow God," he wrote. While appealing to the administrator's personal beliefs may seem like an unusual tack to prevent regulatory rollbacks, Pruitt is known to have strong ties to his faith. In Oklahoma, he was an active member of his church in Broken Arrow, where he served as a deacon and taught Sunday school. Since coming to Washington, he has attended Bible studies with other Cabinet members (Climatewire, July 14, 2017). 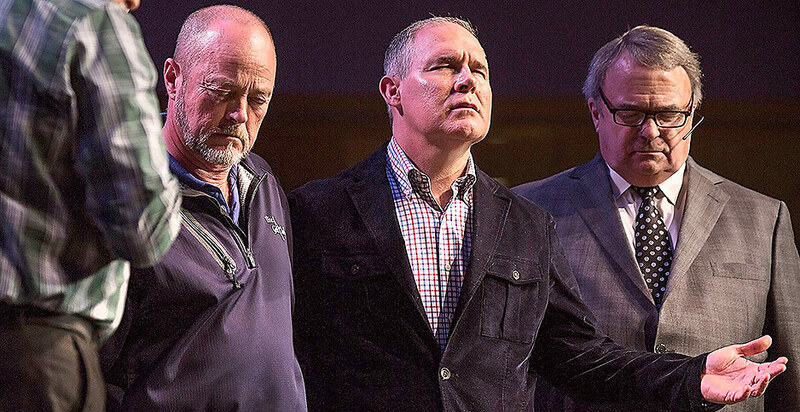 Pruitt often sprinkles his public speeches with religious references, using words like "prayerfully" and occasionally alluding to Scripture. Last November, he attended the dedication of Washington, D.C.'s Museum of the Bible. Commenters attempted to tap into that connection to Christianity to reach the administrator, who has gone forward with the repeal over the objections of environmental groups and public health experts. Many comments filed with EPA began with the same phrase: "As a person of faith, I am very concerned about the impact of global warming on God's Creation." Commenters pointed out that the Bible called for mankind to be "good stewards" of the Earth. That, they said, included protecting against the harmful impacts of climate change. The Rev. Dr. Gail Cafferata, an Episcopal priest, said repealing the Clean Power Plan was undermining "vital health protections." "God has blessed us with this planet with its precious air, water, flora and fauna, and made us stewards of this wondrous creation. From this ethical perspective, any risky exploitation of the earth for human purposes like greed or power or national supremacy is immoral because it offends the Creator of heaven and earth," she wrote. This isn't the first time opponents of Pruitt's plans have attempted to reach him by appealing to his faith. In October, a group of religious leaders made a trip to EPA headquarters calling for the agency to take action on climate change and reconsider its deregulatory agenda. The administrator did not attend that meeting, but the group was able to meet with agency staff (Climatewire, Oct. 25, 2017). To date, there are more than 185,000 comments posted on the Federal Register, and EPA had set a comment deadline of 11:59 p.m. Tuesday. Yesterday afternoon, EPA extended that to April 26 to allow comments after additional public "listening sessions" on eliminating the rule. EPA's first listening session of the year will be on Feb. 21 in Kansas City, Mo., followed by another on Feb. 28 in San Francisco. The final listening session will be on March 27 in Gillette, Wyo., according to EPA. The agency held its first listening session in November in Charleston, W.Va.
"In response to significant interest surrounding the proposed repeal of the Clean Power Plan and the success of the West Virginia hearing, we will now hold listening sessions across the country to ensure all stakeholders have an opportunity to provide input," Pruitt said in a statement. An EPA court filing on Wednesday also asked the U.S. Court of Appeals for the District of Columbia Circuit to continue to keep the case challenging the Clean Power Plan on hold until the agency completed its rulemaking process. So far, most of the posted comments on the CPP's repeal have voiced opposition to the proposal. Some commenters lauded Pruitt's actions, too. One man, David M. Albert, said he thought some provisions of the Clean Power Plan were illegal and the rule should be repealed. He targeted the endangerment finding, a scientific determination that underpins EPA's greenhouse gas rules. "The CPP is proposed due to the Endangerment Finding which itself was enacted without required study. Since the enactment of the Endangerment Finding all of the supporting arguments for it have been shown to be invalid by peer reviewed science," he wrote.